2010 Hurricane Outlook: Heckuva Season, Brownie! Favorable upper level winds: Wind shear (change in wind with height) is expected to be low since the El Niño conditions in the equatorial Pacific have dissipated. Warm sea surface temperatures: Atlantic Ocean temperatures are at record high levels, as much as 4° above average. Continuing high activity era: Eight of the 15 seasons since 1995 are in the top 10 list for named storms. As far as storm landfalls are concerned, NOAA's outlook says that "it is currently not possible to reliably predict the number or intensity of landfalling hurricanes at these extended ranges, or whether a given locality will be impacted by a hurricane this season." June 1 Update: Updated figures for the entire month show heat records outnumbering cold records in May by over 40% (1054 vs. 748). For the week ending May 28, the ratio was almost 3:1. 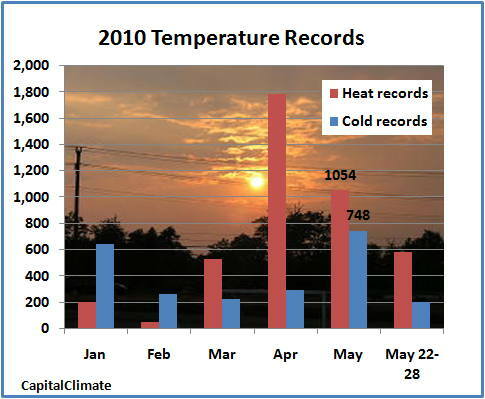 The number of heat records on May 26 has increased to 115 vs. only 7 cold records. May 27 PM Update: The National Climatic Data Center (NCDC) reports that at total of 88 new daily high temperature records were set on May 26 in the U.S., following 164 on the previous day. A total of only 34 low temperature records were set on the 2 days. For the week ending yesterday, the ratio of heat records to cold records was about 2:1. Although January and February were relatively cold, May is continuing the trend of the last 3 months for the number of heat records to far exceed the number of cold records. Several all-time May heat records were broken or tied across New England on May 26. The high of 94° at Worcester was a new high for the month of May and broke the old daily high from 1932 by 4°. Providence also set a monthly record of 96°, breaking the old daily record from 1965 by 5°. The high of 99° at Hartford tied the May record and broke the old daily record from 1965 by 5°. Daily temperature records were also widespread from Pennsylvania through New York and New England and into southern Canada, where an extreme heat alert was issued for the Toronto area. Toronto's high of 31°C broke a record for the second straight day, and records were also set at Peterborough, Ottawa, North Bay and Sudbury. Canadian forecasters are anticipating a warmer than average summer following the warmest winter and warmest spring on record. Images (click to enlarge): Number of daily high and low temperature records set in the U.S., data from NCDC, background image © Kevin Ambrose; Surface temperature map at 3 pm EDT, May 26, shows 90°+ temperatures across New England, eastern New York, and northward into Canada, from Unisys. Paul Rademacher, engineering director for Google Maps, has developed an application (How big is the Deepwater Horizon oil spill?) that plots the surface extent of the BP Gulf Gusher oil slick over any location on Earth. The app was designed to give a visual demonstration of the geographical magnitude of the disaster in terms anyone could relate to their own area. The view pictured here shows the area as of May 21, one month after the Deepwater Horizon rig explosion, superimposed on the Washington DC region. The area of solid oil coverage extends from near Wilmington across northern Delaware, northeastern Maryland, Baltimore City and its contiguous suburbs, much of central Maryland including all of Howard and Montgomery Counties, Washington DC, northern Virginia, and southward into the Northern Neck. Scattered patches extend westward toward the Blue Ridge and Shenandoah Valley as well as southward across the Chesapeake Bay.